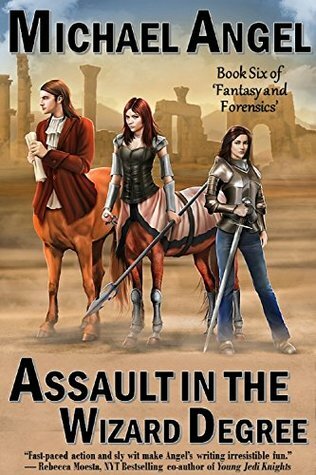 Assault in the Wizard Degree – Fantasy and Forensics Book Six! Pull out your “Happy Dance” ladies and gents! Assault in the Wizard Degree is printed!! The Fantasy and Forensics series has expanded to book six, and six is definitely a magic number. Poor Dayna. The more she busts her backside to save the world on Andeluvia, the more it twists itself into a bloody mess . . . and guess who gets the job of straightening everything out each and every time? Yep. You got it. What is a Forensic Scientist stuck in an epic fantasy land supposed to do? Well, if you are Dame Chrissie, you dust off your hiking boots, gather your tools, and do your best to save the day. Again. Well, salvation is something, at least. A bit of hope, after the court Soothsayer invades the throne room of the King bearing tidings of doom and death. And this time, he might just be right. Dayna’s life in Los Angeles is hard enough as the evil attempting to take over Andeluvia bleeds over into her birth world. Now, an evil long thought buried and gone is awakening. Death and despair, war and horror are looming on the horizon, and Dayna’s small group will be tested beyond anything they have ever faced before. It begins, as do so many things, with a request for Dayna’s help. The centaurs, you see, have a problem. It should be a simple case – use her forensic skills to discover who committed a crime. But what she finds is so much more. The Creatures of the Dark have made deeper inroads than anyone expects (well, anyone other than Dayna and her friends) and even the densest and most purposefully ignorant will no longer be able to deny the truth. There are, of course, the light moments Michael’s writing is so well known for. Characters are well written and believable, the landscape of the world of Andeluvia is sharply drawn, and the storyline holds perfect continuity throughout the series. If you haven’t read the rest of the series, I would highly recommend you do so before reading this installment. I am not saying you couldn’t understand or enjoy this book as a standalone, but it is such a wonderful series it would be a shame to miss the run-up to this pivotal point in the series. This is a Wonderful series, and I cannot recommend it highly enough!! Of course, full disclosure, I work with Michael on his books – but that doesn’t mean I don’t adore each and every one.